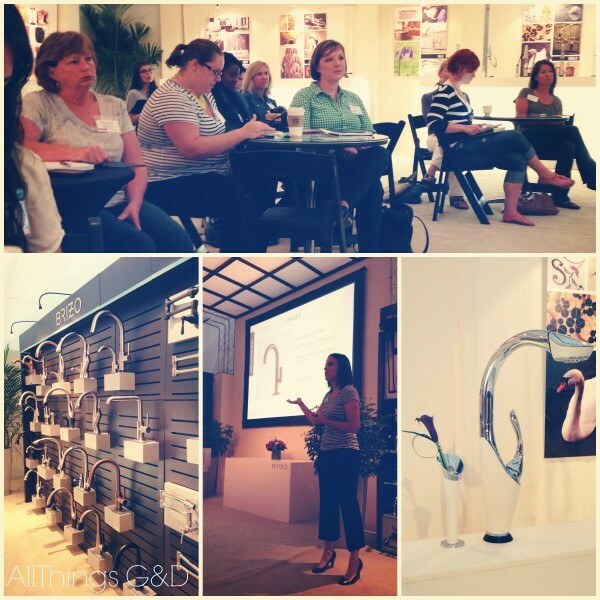 Two weeks ago I didn’t know anything about faucets and shower heads – and to be honest I didn’t really care to give them much thought. Now I find myself noticing how often I touch my kitchen faucet, how long Kate lets the water run at the bathroom sink when she’s washing her hands, and I can’t help but study the flow pattern of the water coming from my shower head. 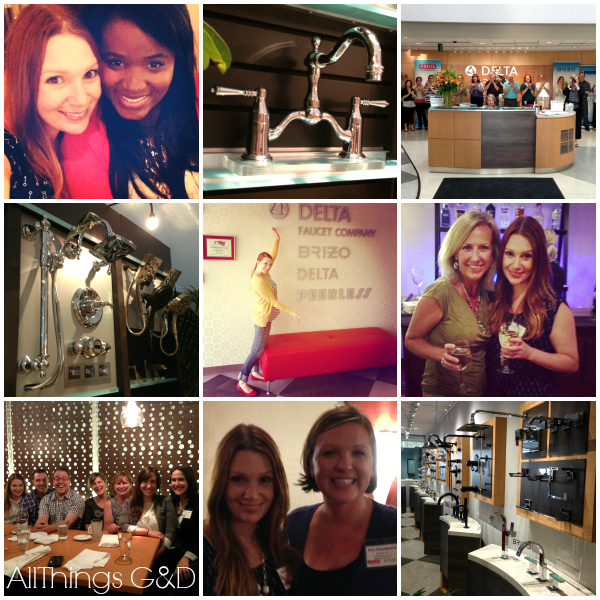 A few months ago I was invited by Delta Faucet Company to attend an exclusive, invite only, all expenses paid, behind-the-scenes blogger’s event at their headquarters in Indianapolis, IN. 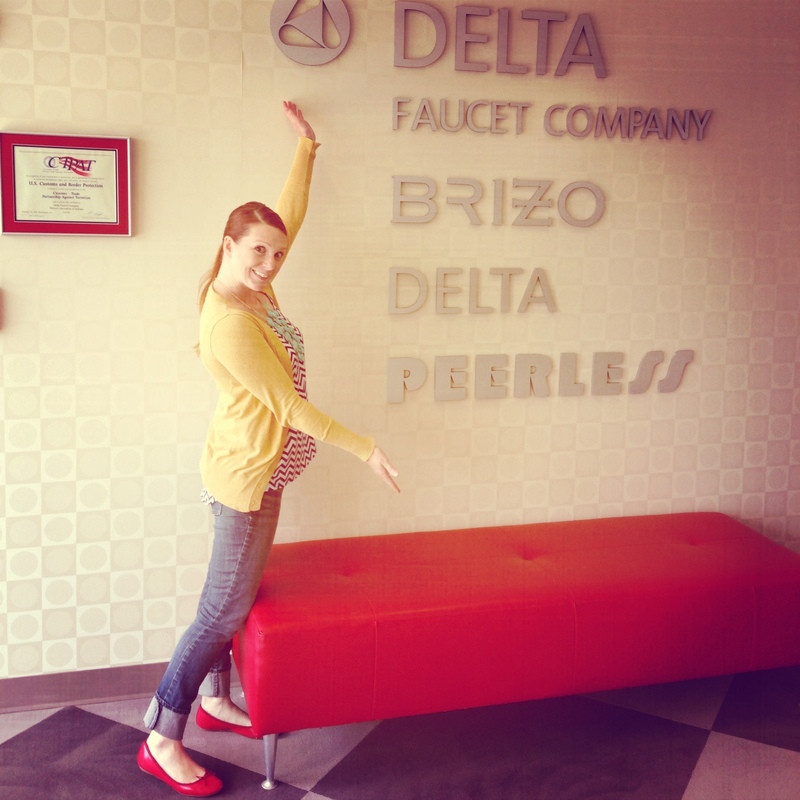 All Delta asked of me in return was to listen and learn – no blog post required. Even if I had an aversion to bathing and my nickname was “Dusty Dirt-Dirt” (which it was, actually, when I was three and liked to make pies out of dirt) I’d be crazy to turn this opportunity down! Lucky for Delta, I’m a germaphobe who washes her hands every five minutes with a wild curiosity for how things work and an interest in how businesses make decisions and market to consumers. Andplusalso I love free trips. I signed on, packed our bags (the dirt pies stayed home) and before long I was introduced to Delta and their brands! 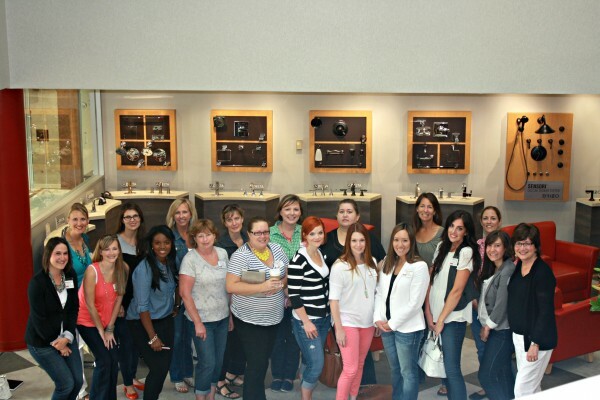 Front Row (L to R): Monique with Delta, Ashley from The Handmade Home, Destiny from A Place for Us, Gail from My Repurposed Life, Christine from First Home…Love Life, Anna from Take the Side Street, Me, Michelle from 4 Men, 1 Lady, Julia from Chris Loves Julia, Jacqueline with Delta, and Paula with Delta. Back Row (L to R): Jen from Balancing Beauty & Bedlam, Katie with Delta, Kim from Sand & Sisal, Monica from Hammer Like a Girl, Kim from Newly Woodwards, Gina from The Shabby Creek Cottage, Hillary from The Friendly Home, and Jamie from That’s My Letter. And check out the welcome we received from Delta’s employees when we walked in! “Why is that?” he asked, skeptically. “Because they’re THE BEST!” I replied. “That’s just a marketing ploy,” replied my husband (who is in marketing). Those Delta people are SMART. They knew that if they hand-selected 15 bloggers from all across the country, invited us behind the scenes and enlightened us with the hows and whys of what makes them different we’d never be able to shut up about it. Here’s an example I shared with G that I think everyone should know: Let’s say you’re interested in a new kitchen faucet and you want one of those fancypants “touch” or “no touch” faucets. You go to the store and scan your options: Delta, Kohler, Moen, etc. Based on the bullet points on the box they all look comparable. You make your choice and go home. A month later – unless you bought yourself a Delta brand faucet with Touch2O technology – chances are you now hate your fancypants kitchen faucet. 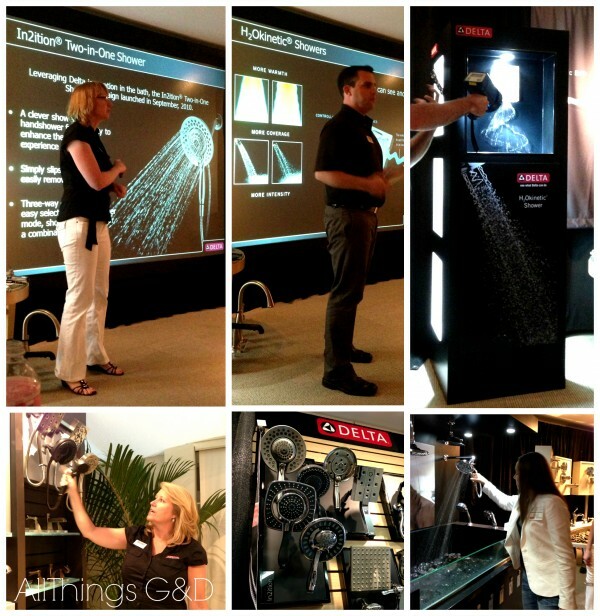 Here’s why: Delta is the industry leader in touch and no-touch faucet technology, and they’ve got the patents to prove it. When other faucet companies try to make a kitchen faucet to compete with theirs they’ve got to work around Delta’s patents. The results are faucets that look good in the box, but aren’t quite as consumer-friendly once you actually get them home and start using them. I saw proof of this with my own eyes and experienced it with my own hands when we participated in a workshop with a Delta Touch2O faucet lined up next to its competitors. Faucets not named Delta that boasted no-touch technology could not tell a touch from a grab – annoying if you simply want to move your faucet from one sink to the other or if you want to use the pull-out feature prior to turning it on. These faucets also have separate water sources for their “touch” and “no touch” use, so if you lift the handle to turn it on, and then touch the faucet, you’ll have activated both water sources and will need to make sure you shut your faucet off using both ways as well. Can you imagine how confusing that would get for your guests?! They would turn the handle off but the water would keep running and they’d have no idea they needed to touch the faucet, too! I don’t know about you, but I think I’d get pretty sick of hearing, “How do I turn your faucet off?” every time we host a party. With a Delta Touch2O you can use touch or the handle, interchangeably, to turn the water on or off, meaning you’ll never have to worry about someone getting confused over how to work your faucet. It’s technology that works with you, versus technology for the sake of technology! Some of my fellow bloggers testing out Delta’s Touch20 Technology. Something else I learned is that Delta has a patent on what constitutes a “touch” for their Touch2O technology. A brief tap and you’ve got water! 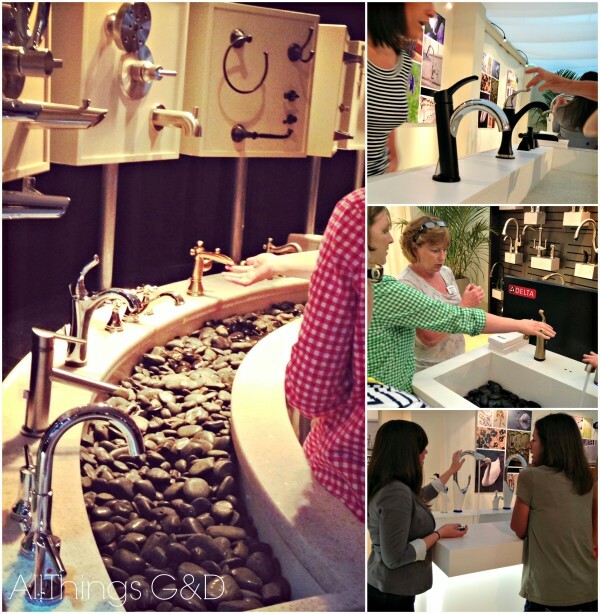 Competitors trying to duplicate Delta’s Touch2O technology have to honor Delta’s patents, therefore their touch faucets have to be touched for a longer period of time before the water turns on. Do you know how frustrated I would be if I bought another brand’s “touch” faucet only to discover it’s wasting my time versus saving me time?! 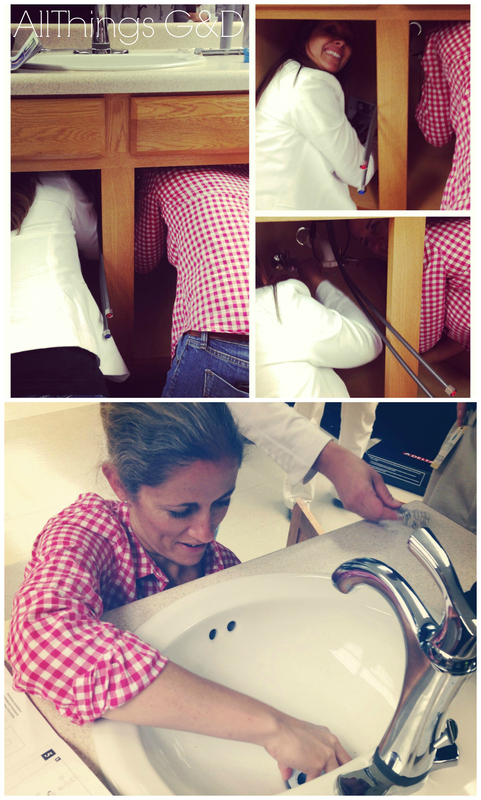 We had the chance to see some behind the scenes footage of how this incredibly creative commercial was filmed, demonstrating how quickly and easily you can tap a Delta Touch2O faucet to get it to turn on and off (the music the water makes is to the tune of “Reach Out, I’ll Be There” – so clever). Don’t even get me started on the “no touch” kitchen faucets – you know, they’re like the faucets you find in public restrooms with the infrared (IR) technology that you have to dance around and move your hands back and forth like a magician to find the sweet spot to finally get the faucet to turn on? I don’t even want to get into them because you don’t want one. 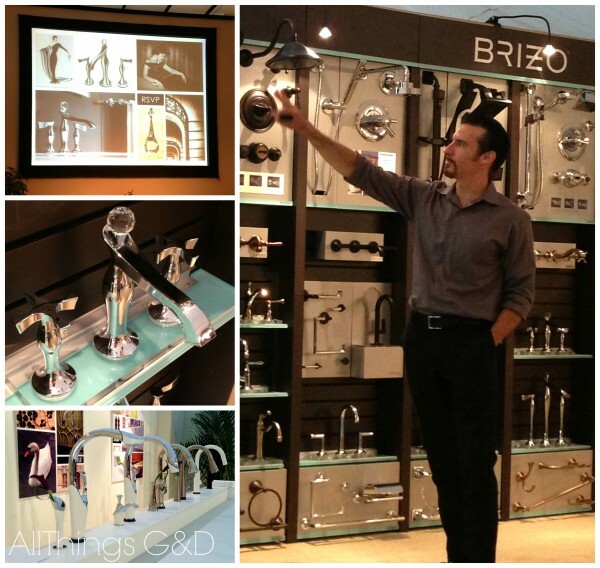 You know where you do want a no-touch faucet? Me, and anyone else with children who don’t understand the concept of “Turn the water off – YOU’RE WASTING IT!” needs a lavatory faucet featuring Delta’s Touch2O.xt technology. Unlike those cheap IR faucets in airport bathrooms, no magician hands are needed here. Delta’s Touch2O.xt technology uses your body’s energy to sense when you’re within 4” anywhere around the faucet to activate the flow of water. It doesn’t matter if you’re not standing directly in front of the faucet, what color of clothes you have on, your skin tone, etc. Get within 4” of a Delta Touch2O.xt and it will turn on. Get out of its force field and it will turn off. The mom in me is absolutely drooling over this technology! An overview on Brizo – Delta’s luxury “fashion for the home” brand. One of my favorite products were their In2ition Two-in-One Showers and H2Okinetic Showers. The In2ition shower heads have a handle allowing their center to pull out for hand showering – perfect for washing my daughter’s hair when she showers! The H2Okinetic showers feature innovative Delta technology that shapes the water into a spiral pattern as it leaves the shower head, meaning more water coverage and wetness using less water! 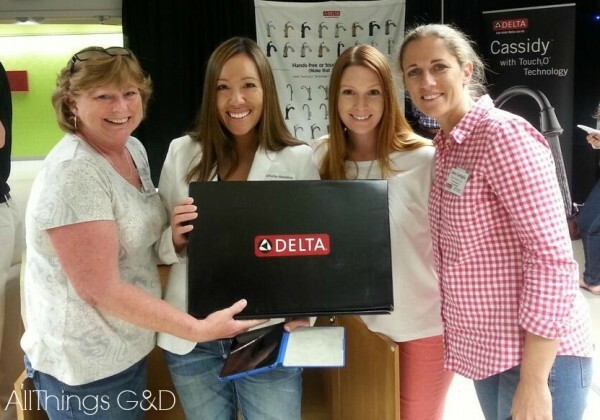 Gail from My Repurposed Life, Michelle from 4 Men 1 Lady, Me, and Jamie from That’s My Letter – about to install our first Delta faucet! Jamie and Michelle getting down and dirty with Delta! Thank you so much to everyone at Delta Faucet Company for your gracious hospitality, informative presentations and creative workshops. I was so thrilled to have met so many wonderful people and to have been a part of this fantastic opportunity! Awesome recap Dusty! It was an amazing couple of days for sure! Sharing this on my Facebook! It definitely was, Christine – and it was so wonderful to meet you! Thanks for the share! Thanks for this! We are in need of a new faucet and it will be Delta for sure. I’m so happy to hear it, Crystal! I was JUST telling my husband two days ago how much time I bet it took to set up those faucets for that commercial. And its a pretty short commercial too! Lots of interesting stuff, for sure! It definitely was, Christine! Such a neat experience. Thank you for your comment! Thanks for sharing. We’re in need of a new shower head and the In2ition Two in One looks perfect! I’m so happy to hear it, Kelly! We just received ours in the mail and I’m so excited to hook it up and start using it – I’m sure we’ll BOTH love it!